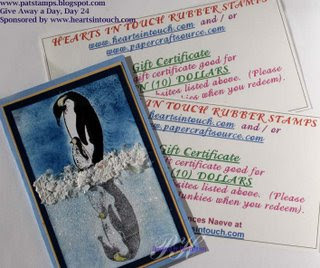 Today's TJNL Anniversary sponsor Hearts in Touch is giving away two $10 gift certificates. To enter today's giveaway, leave a comment on Pat's blog entry telling her that you would like to enter. Enter by 11:59pm EST on Thursday, October 25 for your chance to win.